Posted by Cyril. February 27th 2015. 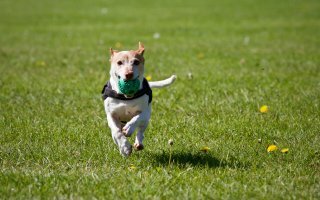 Known as the ‘sausage dog’, this little canine is a small and playful breed originally bred as a hunter. 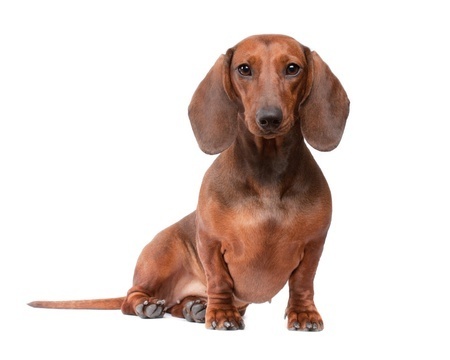 Popularly known as the ‘sausage dog’ owing to its long body which is accentuated by its short legs, Dachshund puppies and dogs started life in Germany centuries ago. It was bred to hunt badgers and gets its name from the German word for this prey – ‘dachs’. Today, the Dachshund is a popular pet ideal for flats and houses. There are three types of Dachshund: short, long and wire-haired. Each of these varieties has three different sizes: toy, miniature or standard. One wouldn’t necessarily associate the Dachshund with the hound family but it is a small breed of dog from this group of canines. After all, it was a hunting dog in its early years. Its original work dog purpose led to the development of a long, muscular body with a prominent sternum and elongated head plus dark, oval eyes. One of its most distinctive features is its set of long, floppy ears which hang down each side of its head. These power-packed dogs can be a range of colours including solid tan or yellow or bi-colour black, grey and brown. A Dachshund can be piebald or mottled silver, blue or chocolate. They range in length from 12 to 18 inches, are 5 to 9 inches high and weigh anything from 8 to 20 pounds. The Dachshund is not very easy to train being quite a wilful dog but what it lacks in the obedience department it makes up for by being a mischievous and affectionate. It gets on well with people, are loyal to their families and usually like other pets. A word of warning though, it’s quite vociferous meaning it likes the sound of its own voice so barks whenever it feels like it. It’s best to socialise a Dachshund with other dogs from when it is a small puppy in order to avoid any aggressive behaviour when it is older. These dogs make good travellers as they are comfortable passengers on a train or in a car. 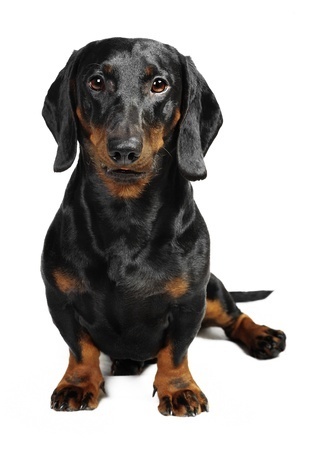 Unsurprisingly, a Dachshund is vulnerable to spine problems owing to its long back. For this reason, it’s better to carry it up and down stairs so that it doesn’t harm its spine in the long run. If it is allowed to lie down on the sofa, it is wise to prevent it from jumping off as this may cause back damage. It is better to gently lift a Dachshund off a seat. It is vital that this dog is not fed too much or it will soon become lethargic as any extra weight it gains can increase strain on its long spine. This breed enjoys moderate exercise but don’t overdo anything because of its vulnerable back. It can also suffer from heart disease, diabetes and urinary tract problems. A typical lifespan is 12 to 15 years. Long-haired Dachshund needs to be combed on a daily basis while the wiry-haired types need to be groomed twice a year. Smooth-coated dogs should be wiped down regularly with a clean, damp cloth.